The second part of our interview with Bob Moesta discusses topics specific to start-ups. We look at how a start-up can apply these Jobs To Be Done thinking, why hypothetical feedback is useless, and why beta testing must also test for value. Part one of the interview was posted previously. Des: The classic examples I read about applying Jobs To Be Done involve improving a product based on what it’s currently being hired for, for example improving a milkshake to make it a better drink for a daily commute. When you’re a start-up, with no existing product to analyse, how can you apply this line of thinking? Bob: Identify the struggling moments. The times when the buyer is taking the time to say “You know, there has got to be something better than this“. You have to understand the switching mechanism. Lots of people can design a great product that’s better than all the competition, and lower priced, but it still never takes off. People aren’t struggling enough to want to switch. The cost to switch is just too high. They’re not even thinking about the purchase, because it’s just not that important in their life. Are people actually looking for more here? Is this market underserved? Are they switching and stopping to listen to other people? Can we find the switching mechanism? Are there moments when they’re considering what they listen to? What I’d do is ask questions like “Tell me about the last time you found a new blog, or something you started to read” and then also “Tell me about a time you stopped reading a blog“, so I can understand the switching behavior. Firstly, how did they know it was time to switch and secondly how did they pick the new blog? What was the criteria? You’ll find there is a hiring process they go through. It’s as much about finding out what people like as it is about finding out why they switch. Des: Identifying these hiring and firing times could be important beyond product design? Can it also help with customer acquisition? I built a thousand homes in 3 years; when the market was on its way down by about 60% we were on the way up by about 20%. The question we asked was “How many people want to move, but can’t?”. People didn’t want property, they wanted relocation, they wanted to live in a different area. By understanding what was going on, we moved ourselves from “selling new homes” to “helping people move”. When we reframed ourselves that way and made sure we understood what people choose, how they choose, and when they choose. By doing this we were able to reduce our costs of advertising, and we were able to take our product down market and make more margin. Know how people switch and when they switch is the key to a lot of growth. 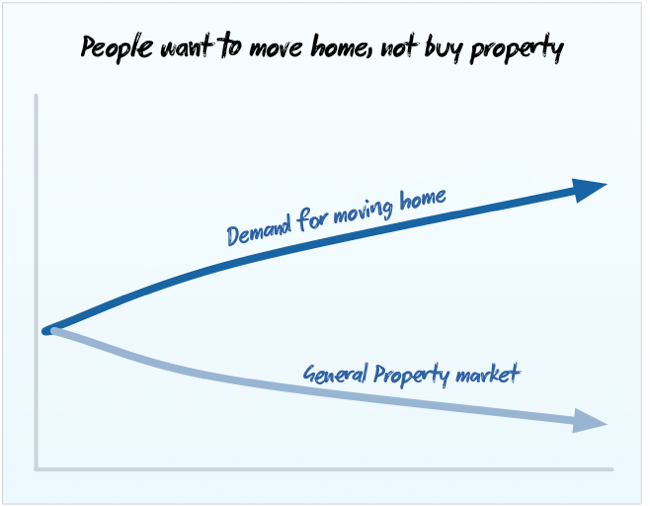 Des: So is the shift from selling “bricks and mortar” or “land” to selling “Relocation”? People knew there were homes out there to buy, but they couldn’t see past their existing position? Bob: That’s right. People don’t think they can get rid of their old house. So what we would do is find people who wanted to move, and couldn’t afford our house, but they could afford the house that the other person was willing to sell, so we would help everyone in the chain. If you put people in focus groups they’ll tell you they want stainless steel furniture, hardwood floors, all these features and benefits, so you’d build them and no one would buy it. But you include a moving service, or for a divorced mom who’s splitting furniture, I’d include furniture from Ikea and I would literally sell more homes. Understanding what people are going through and what job they need to get done helps you understand the trade-offs people make. 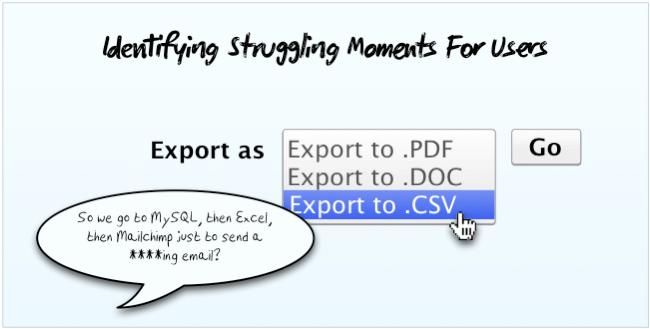 This lets you know what you need to integrate into a product or service. Des: You’re perfectly pairing a problem with solution designed for it? Bob: Exactly. But you have to be careful. Some people feature load and then test concepts, but they only ask in a way of future orientation. Do you like the product and would you buy it? Then they just keep adding more features until they hear “Sure I would buy it”. That doesn’t work. Bob: In the jobs framework we never talk to anyone who wants to buy. Ever. We only talk to people who have bought because embedded in their choice set is the value code of what they’re willing to switch from and to, so we don’t over-engineer the product. Des: That’s fascinating, that’s something the world of start-ups could learn from. Rather than trying to address hypothetical markets of would be consumers, you’re looking at people who have consumed. So much of of the popular advice is to build an early beta, send it out, see what people “think” etc. You’re saying that’s not the right question to ask? Bob: When you give it to people for free you don’t really have the value code embedded in it. A beta test should always be “It’s good for this period of time, only” and then you have to make them pay. When you make them pay you’re now willing to understand the value code of what they’re willing to give up. Otherwise they’ll just critique you for stuff they’d never pay for. It’s brutal. Part of what you’re testing has to be the value. The software world is caught up in this feedback of satisfaction, they’re improving things that no one is willing to pay for, but people are willing to take it because it’s coming for free. It’s why I love the guys at 37Signals. Their approach is “We design the product, we use it, and we know it’s the best it should be. People are gonna give us all these recommendations, and we could spend all this money improving it, but people will still use it, they’re not going to switch. And when they do switch, they switch upmarket to places we don’t want to be.” What a great business model. Des: What I really like about addressing only people who are using it, is that it cuts out self-fulfilling feedback, where one by one you try to nail the idle desires of each customer. In these cases, you’re not adding value, you’re just adding code. Bob: That’s right, so people say “We need a full concept to test” and I say “No you don’t, give me what you have”. I take what they have, and find people in their struggling moment and see if it works. Nine times out of ten the things product owners want to improve things that customers don’t even care about. Concept testing is not done in groups, it has to be in one-on-one sessions in the context of when they’re choosing. It can’t be things like “How much do you like spaghetti?”, because to some people spaghetti is the Wednesday meal with the family. That’s the context. So when I have spaghetti in a restaurant, do I like it as much? Heck no. Those important subtle details all get lost in these group sessions. Des: That’s a fallacy of a lot of user testing labs where they style up a room in a design studio to look like some generic living room. Then they bring in a family and throw a tablet PC at them and say things like “This is exactly how the family will react at home”. They ignore everything else that happens at home, a dog barking, the kids fighting, a phone ringing, dinner being cooked etc. Bob: I laugh, because as we get new clients in the consumer packaged goods area I always go and spend hours in the aisles of supermarkets just watching people buy. And you can tell when someone can’t find a particular product versus someone who’s willing to switch. They’re picking up the bottles or cans and reading and looking at them, reading, looking to be convinced. You can see how hard it is for the consumer to switch, based simply on some ethnography. Des: That reminds me of the Google+ versus Facebook battle. For many Facebook is just the only place they’re going to go. You can see how hard it will be for Google+ to motivate that switch. Bob: Right, but what Google are doing well is trying to target some of the non-consumption moments. Times when you want to say or post something but you don’t want everyone to hear it. Google build a whole circle notion to tap into this. The opportunities there are all around non-consumption. It’s like Siri, how many times does your keyboard come up and you just say “I’m not gonna send that text cause I gotta type it, and I’m busy”, but now that I have Siri and I can talk to it I literally text 300 percent more, because I talk by text. Where Siri is successful is not in overtaking existing behaviours but in tapping into that non-consumption. Des: Reminders in Siri is a great example of this. Software has existed to remind me about things at times for 10 years now. But it has never been worth it to use a UI. But with Siri I can just say “Remind me when I leave to bring my keys home”, which is perfect. Des: Thanks so much for your time Bob. There’s a lot of good ideas in this work, am I right in saying there’s a book coming out on this topic? Bob: So I’ve been helping Clay and others at the Harvard Business school write a book, my role is to provide examples to back this up. Another thing we’re working on is an online course, about 6-8 weeks, and we’re in the early stages of building out this course. Des: Excellent, and in terms of keeping tabs on you on Twitter, you’re @bmoesta on Twitter and you keep a popular blog at Rewired. Thanks again! We’ll be doing a short follow up with Bob to tackle questions from readers and listeners, so if there are areas you’d like to hear more about, post a question in the comments, or send it to @destraynor and I’ll ask Bob to elaborate.